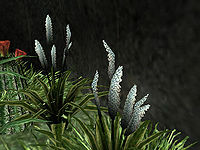 Mana Blooms are a rare flowering plant found almost exclusively on the plane of Gaiar Alata. There are two varieties of Mana Bloom: blue and purple. 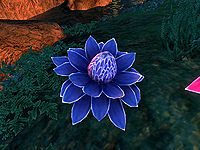 Blue Mana Blooms are used for harvesting Lichor while purple Mana Blooms give Ambrosia. A small flowering shrub found in the Colovian Highlands and near the city of Bravil. Grows abundantly anywhere there's water. Farmed on plantations in the Ascadian Isles for its sweet pulp. 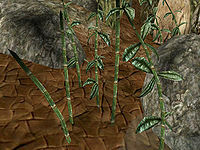 Meadow Rye is a green and white reed found growing in the city of Mournhold. 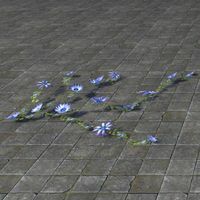 These tiny blue flowers are common in gardens devoted to the goddess Dibella. A patch of Midnight Sage. 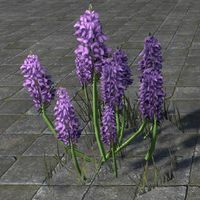 These purple flowering stalks are common in gardens devoted to the goddess Dibella. 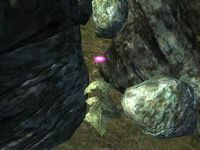 A plant with magenta flowers, found mainly in mountainous regions and along the Cyrodiilic Gold Coast. 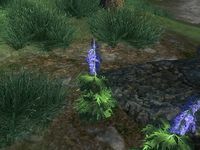 Monkshood is a common flower found in Cyrodiil's Heartland and in the Nibenay Basin. A sturdy cane that smells sweet when bruised. 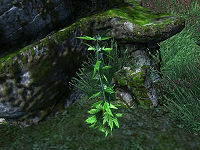 It is the source of the titular product, Moon Sugar, and can be found growing on plantations and farms in Khenarthi's Roost and Reaper's March. 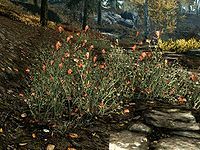 A spicy smelling flower that grows in Orc's Finger Ruins. They are allegedly not poisonous. 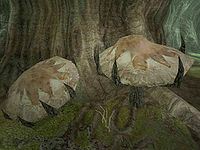 A beige colored shelf fungus native to Skyrim, commonly found on rotting logs. 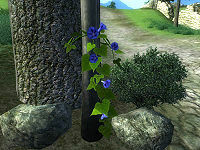 Morning Glory is a domesticated vine that flowers with a blue head. It can be found in the wilderness of the West Weald and Heartland regions. 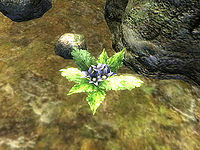 Motherwort is a versatile plant found across Cyrodiil, excluding the Blackwood region and the Gold Coast. A bushy flowering plant with four color varieties: Red, Blue, Purple and Yellow. 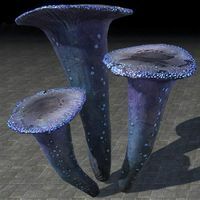 Muck Sponge, or "muckspunge," is a common plant growing in the West Gash region and along Azura's Coast, often farmed by the native Dunmer of Vvardenfell for its mildly toxic slime secreted when crushed. 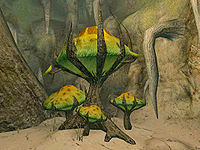 Mushroom Tree saplings are found across the Shivering Isles. 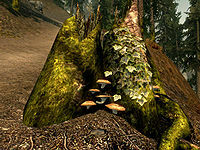 Greenmote, an extremely potent drug, is extracted from the saplings of the Mania region. The Dementia sapling produces the equally dangerous Black Tar, a toxin in both solid and liquid form that is collected from the tree itself or from the strings of tar that hang from its limbs. This page was last modified on 8 January 2019, at 21:35.